Cuddle Time Cotton Fabric now OUT OF PRINT fabric by Quilting Treasures. 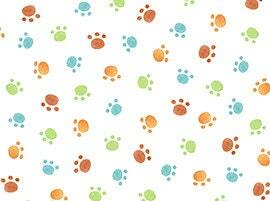 A sweet white background fabric with brown, green and blue puppy paw prints dancing across the fabric. A beautiful addition to any baby quilt or baby nursery. This fabric is out of print so when it is gone we will not be able to order additional fabric. So buy yours today! All fabric from The Quilted Nursery Fabric Store is cut directly from the bolt with generous cuts. Any overage in shipping charges are refunded and shipping same day always!